If there is a perfect start to a Coast to Coast backpack, this was a close as I’ve ever experienced. Thinking about it now I only wish I’d had more time just to sit awhile and take it in. But there were another 5 corbetts ahead of me on that first day, and so with reluctance I turned my attention east and started the steep descent ahead of the next. 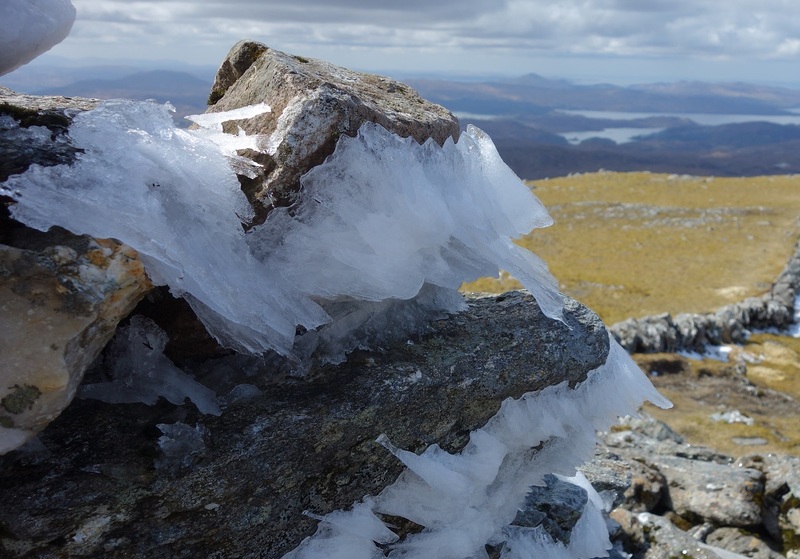 What follows isn’t intended as a blow by blow account of my TGO crossing, simply some reflections on the route, what it was like to walk and the route changes I made along the way to fit in with the weather and improving fitness. It may be useful to anybody else walking parts of it in the future. 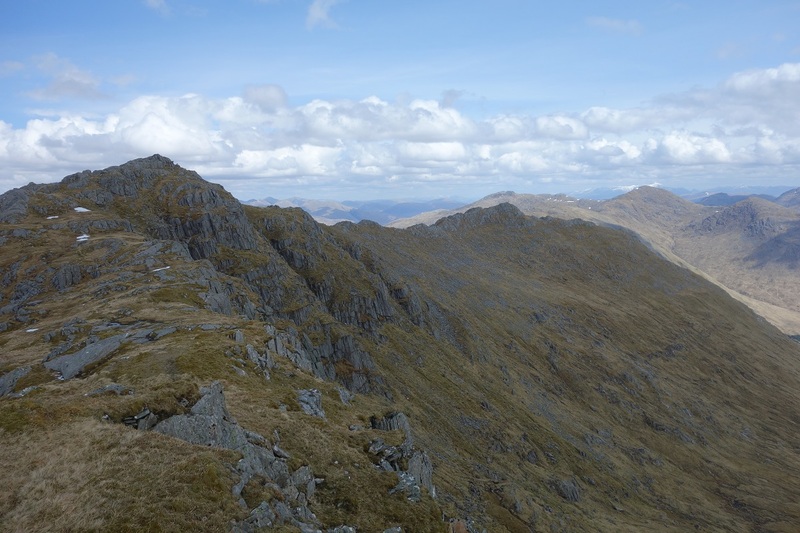 I set out to walk 366 km, and climb 25 munros and corbetts along the way. With quite extreme weather on days four and five I reluctantly dropped 2 days of high level waking, and rerouted them to avoid high level exposure and potentially difficult river crossings. As luck would have it later in the trek I was able to reroute days to go higher than planned due to fitness, in fact eventually walking over 380 km, and cimbing 27 munros and corbetts. I’ve shown the changes I made along the way on the maps. 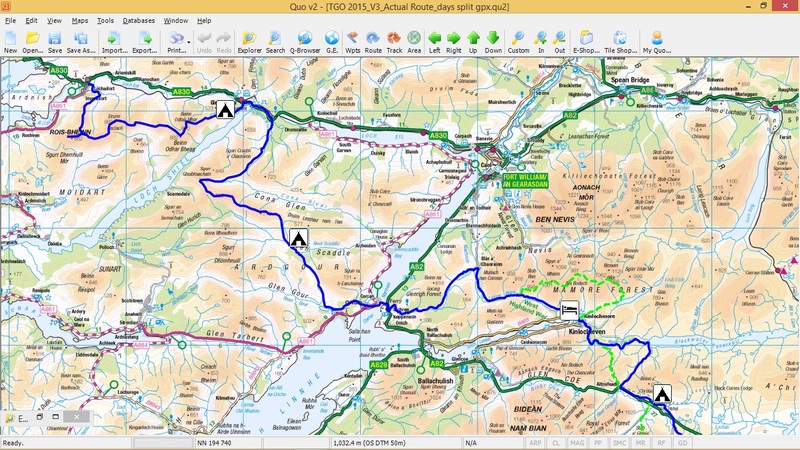 The route I eventually followed is shown in BLUE, with any original parts I changed shown in GREEN. Make no bones about it, this was a hard day, one of the hardest days walking I can remember. 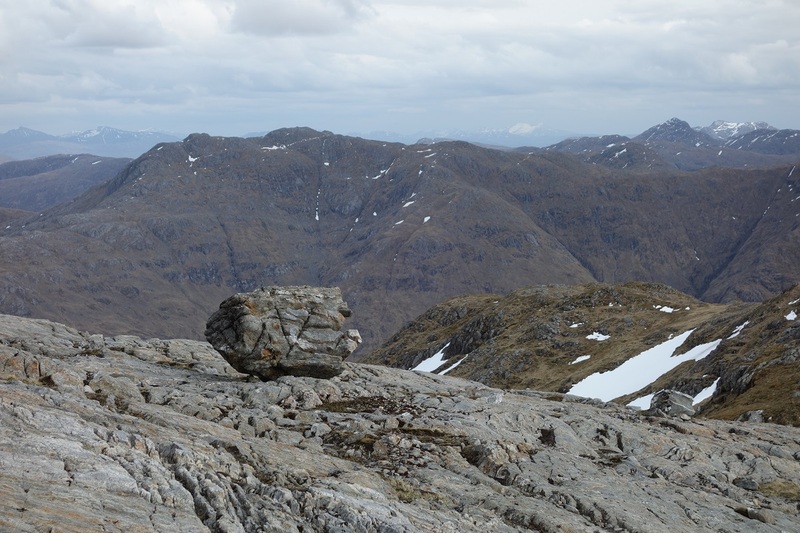 There are 5 corbetts in all between Lochailort and Glenfinnan, each one separated by a significant drop in altitude, and miles of trackless and rough terrain between. It’s a tough challenge even as a day walk, but throw a full pack into the mix and it really tests your resolve, particularly as a first day out. 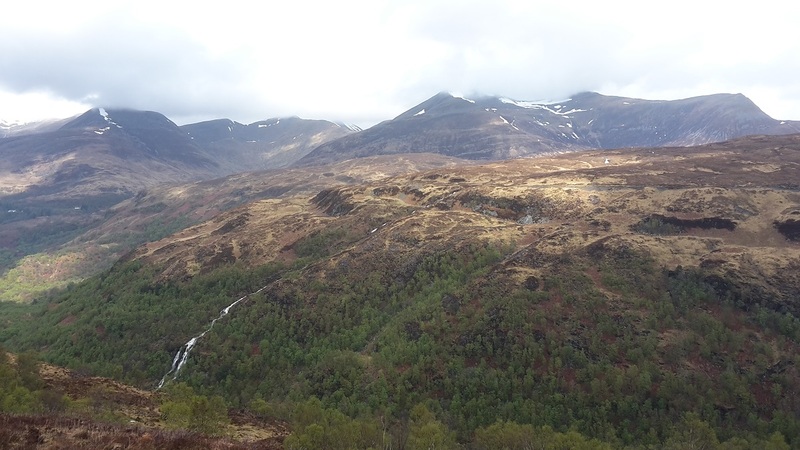 My original plan had been to cache 3 days food at Glenfinnan on the journey out from Fort William, and then cross the Moidart corbetts as light as possible with only a days supply. But seeing the snow from the train on the journey up I’d pretty much written off that first day and decided the foul weather alternative by Loch Beoraid would be more sensible. When the first day dawned, blue sky and wall to wall sunshine, I couldn’t resist but was faced with trekking over these western giants with a full four days food. For all that it’s a superb high level walk with views to die for to all sides. This for me is what I like best about Scotland, the ability to still find somewhere which to all intent appears completely untouched. 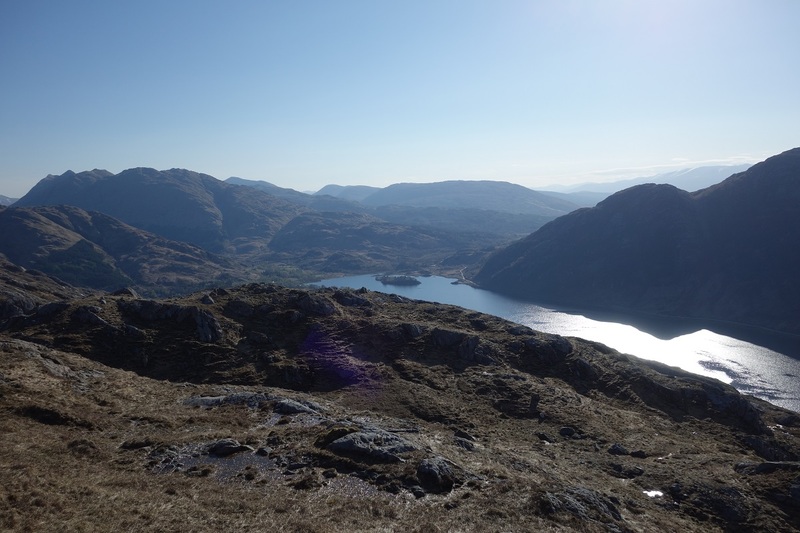 The Moidart Corbetts are completely trackless though route finding is easy enough and it gives a very different experience to the well trodden hill tracks. I finished the day at almost 8pm, completely wasted, exhausted and most probably badly dehydrated. I’d run out of water half way and been sucking on mouthfuls of melting snow for the last few miles. When I eventually camped I had to force myself to eat something, my appetite having deserted me several hours earlier. 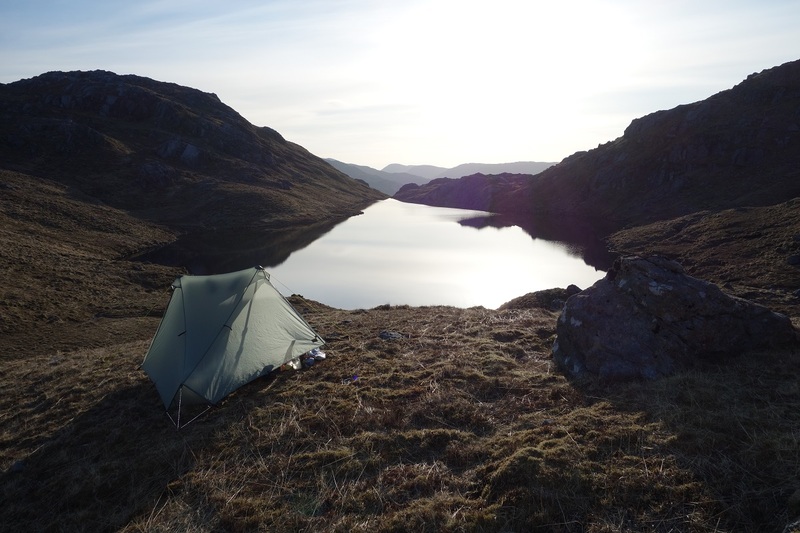 And Lochan nan Sleubhaich was a great place to spend the first night. a lovely spot with plenty of water, a couple of dry elevated pitches at the west end, and a glorious view east. 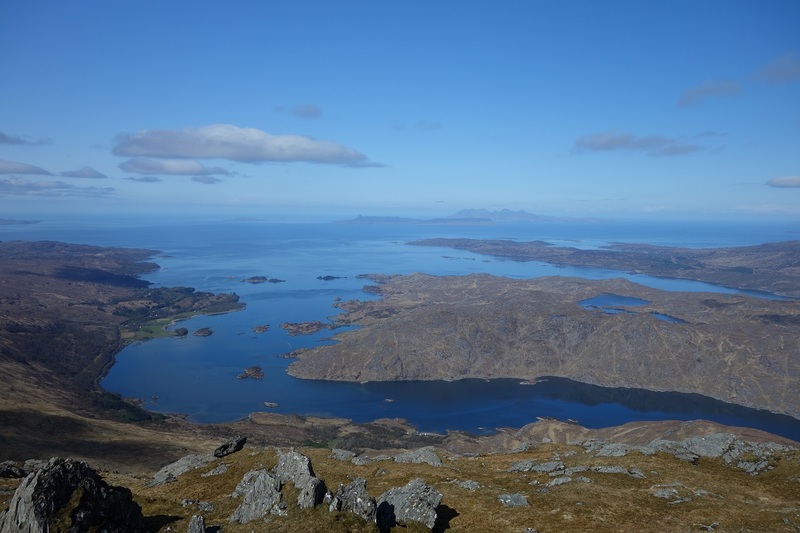 If you have a good pair of hill legs and set of lungs, I’d encourage you do the Moidart Corbetts, but perhaps take an extra half day over it and be prepared for a rollercoaster of a trek. You’ll meet nobody, it’s bliss. If that first day made me smile from within, the second day made me positively grin until my cheeks ached. It was barely a couple of km from the nights camp down into Glenfinnan, but the ground is extremely rough with grass tussocks and hidden rocks threatening to twist your ankle with every step. And if you hit the shores of Loch Shiel too soon you find your route halted by a sea of rhododendron with no way through. So when you eventually reach the track out past the hotel it comes with more than a touch of relief. You can get refreshments at the information office in Glenfinnan, but I was a little early for that. So after a brief rest overlooking the Jacobite monument it was then a few miles of easy walking on forest tracks round into Allt na Cruaiche. And from there for the rest of the day was an absolute joy of a walk. 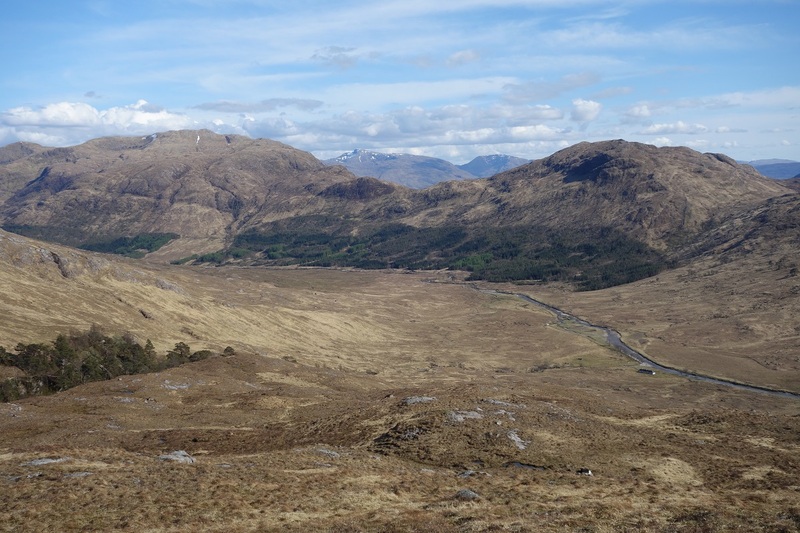 First there’s an easy track and then path south up the valley to meet with Cona Glen, but then rather than head east down the valley towards Corran as most others do I turned right up into the deliciously wild head of Cona Glen. Here again it’s completely trackless; just you, herds of deer and wonderful panoramic views ahead and particularly behind if you remember to turn around and look. It takes a while to work your way up, but it’s well worth it. From the blealach at the head of the Glen a broad ridge then runs east between Cona Glen and Glen Scaddle, rolling over humps, bumps and rocky outcrops (including a Corbett and a Graham) as it makes it’s way towards Loch Linne. All the way along you have fine views ahead to the distant Ben and the Mamores and to your right Loch Shiel and Glenhurich are set out in minature. It makes for a wonderful hill walk, and safe in poor weather as the posts of an old metal fence follow the ridge along most of its course. It’s possible to follow the ridge almost all the way to Loch Linne, instead of which I dropped into Glen Scaddle about half way to pitch by the Tighnacomaire estate bothy (which incidentally is locked). Glen Scaddle is beautiful and less frequented than Cona Glen and makes a lovely place to camp. I enjoyed a peaceful warm evening alongside the River Scaddle, chilling out, washing and drying clothes in the warm evening breeze and listening to the radio. 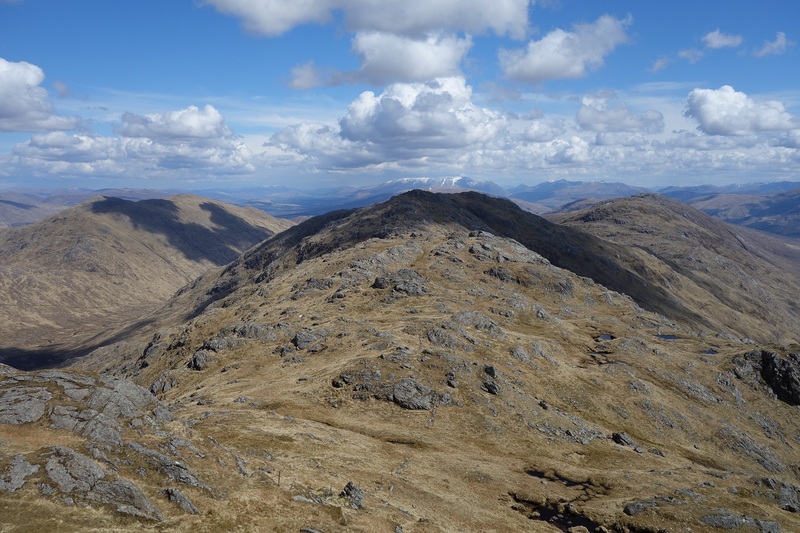 If you plan a TGO route from Glenfinnan to Corran via Cona Glen and the weather is good, I heartily recommend a diversion along this ridge and into Glen Scaddle. It’s wonderful. After two days of blue skies the weather had begun to break during the night with some light rain and a stiffening breeze, but as I’d not planned to go high today it made no difference. I’d had an option of taking in an additional Graham overlooking Loch Linne, but in poor visibility it wasn’t worth the detour. It’s also of course possible to walk out the full length of Glen Scaddle to where it meets with Cona Glen and then follow the quiet loch side road for a few km to the Coran Ferry. 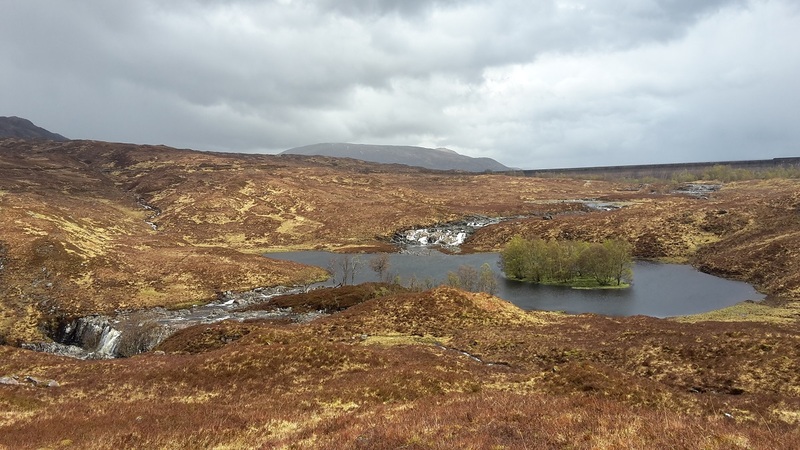 Rather than that I ascended the forest opposite Tighnacomaire to Tom Uaine, then across the bealach and down to Lochan nan Gabha, arriving at the ferry just as Jean and Tony Pitchforth arrived. It’d been raining persistently, if lightly, for most of the morning and showed no signs of easing off. So once across the ferry (which is free for foot passengers) the three of us headed for the Four Seasons pub at Inchree for a lunchtime pint and a coffee…or in my case two pints. Jean and Tony stayed for a spot of lunch but as soon as the rain abated, albeit it briefly, I headed off again to follow the obvious route from Inchree through Glen Righ Forest to meet with the West Highland Way. 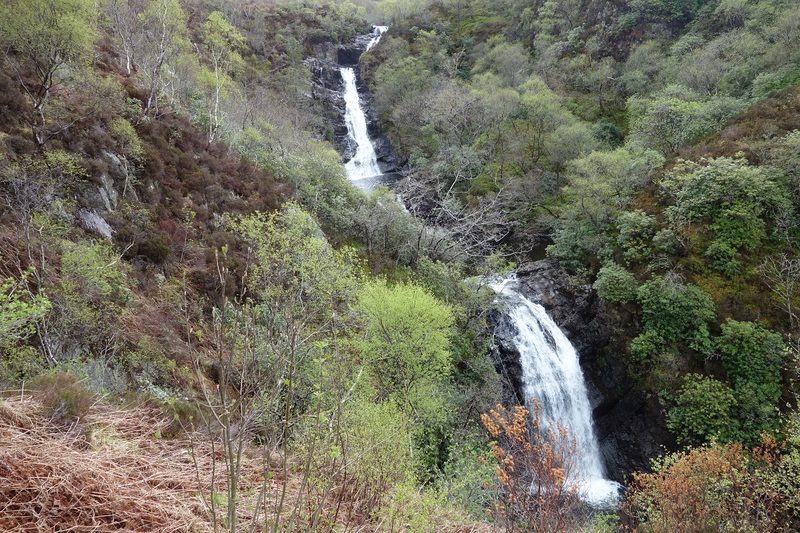 A path climbs pleasantly alongside the Abhainn Righ with fine views of the Inchree Waterfalls before meeting with a forest track which climbs steadily amongst the spruce and pine to the forest edge. 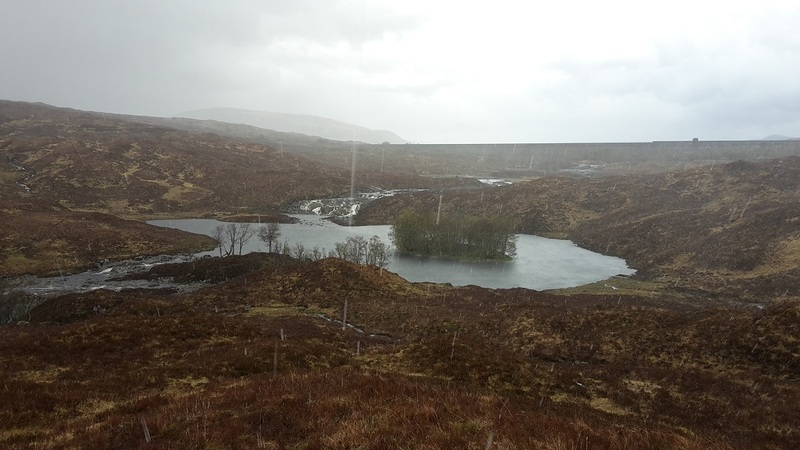 It didn’t in fact stay dry for long and by the time I emerged from the forest to head across to Lochan Lunn Da Bhra it was teeming down. Even on a grey afternoon it was still easy to see that this stretch across to the Lochan would make a wonderful location for an overnight camp, with numerous walled enclosures lower down offering shelter. It was still quite early in the day though and I’d planned to camp by the ruined croft at Tigh-na-sleubhaich to set me up for the Momores ridge the next day. The rain however just got heavier and heavier as the afternoon progressed and by the time I reached the croft I was thoroughly drenched, and the track and ground had become a river. 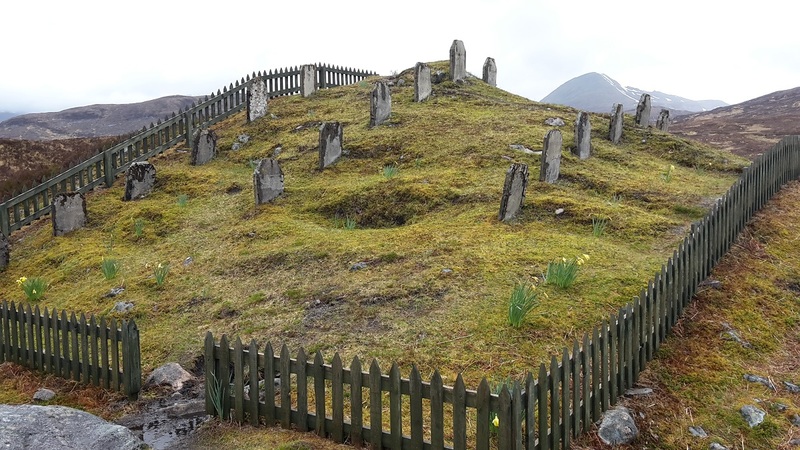 The croft itself stands at the high point of the old military road over from Kinlochleven used by the West Highland Way, and the wind was driving the rain horizontally past the ruins. 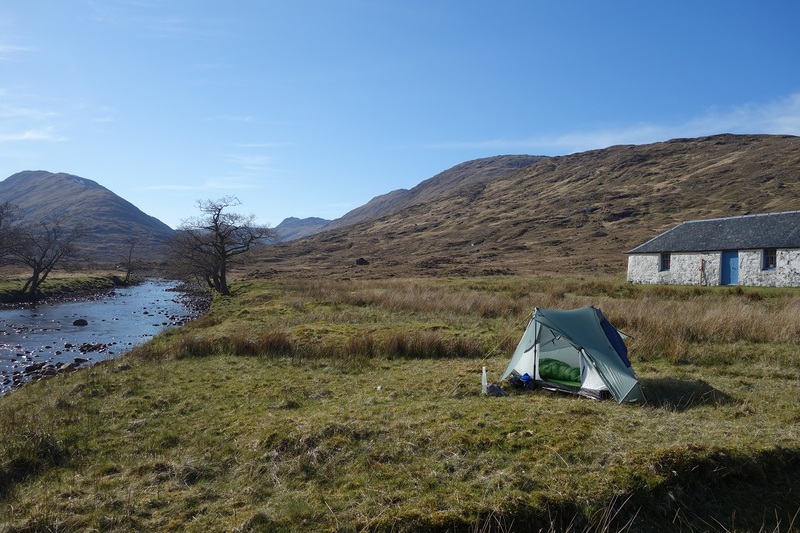 Rather than endure what could have been a miserable night I pressed on to Kinlochleven for a dry night at the Blackwater Hostel. If the weather was as bad the next day then the decision would pay off, but even if it cleared I could stash my pack in Kinlochleven and trek the Mamores ridge in reverse, dropping down to pick up my pack on the way back through later. The decision turned out to be a good one. For an oh so brief moment at breakfast it looked like the rain had passed. Looking up at the hillsides from Blackwater Hostel it was clear that the raging white water of the mountain streams had calmed overnight and you could feel the sun trying to force it’s way through. That lasted about as long as it took to eat some porridge and collect my dried clothes from the drying room after which there was something approaching a tropical rainstorm outside. I’d left my camera in the drying room overnight too after rather hopefully taking photos in the previous days downpour. Water and digital cameras don’t mix and attempts to bring it back to life overnight had failed. For the next few days I had to use my phone to take photos. After picking up a resupply parcel from the post office and arranging with my wife to post a spare camera on to Bridge of Balgie (Day 7) it was clear I’d have to adjust plans. The Mamores were definitely off the cards that day, as was in fact my foul weather alternative which had been to head up to Blackwater Reservoir along the north bank of the River Leven. But the chances of crossing the river below the dam was about as likely as a balmy spring day so I cut my losses and set off up the south side avoiding the later crossing. The walk up to Blackwater gives some amazing views back down to Kinlochleven and across to the Mamores as it steadily gains height. and for much of the way you can keep your feet dry and level by walk along the roof of an old water culvert that runs all the way to the dam, passing the bleak and poignant site of the navvies graveyard. It was a strange day weather wise. One minute it would be pouring down, the next minute you’d be basked in glorious sunshine. At one point sheltering beneath three lone pine trees besides the dam there was deafening crack of thunder above, and a blinding flash of lightning nearby in Glen Coe. Within seconds it was hailing hard as I fled to find somewhere to shelter that formed less of a lightning conductor. One minute it’s pouring down…. And that was pretty much the order of the day. 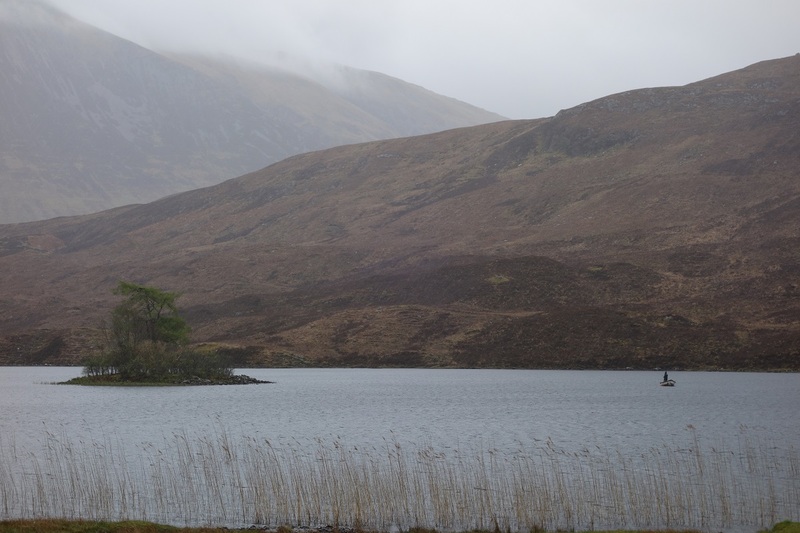 Following the route the ale hungry Blackwater navvies used, to get from the reservoir via Lochan na Feithe across to Kinghouse in Glen Coe, felt particularly exposed in the threatening weather. 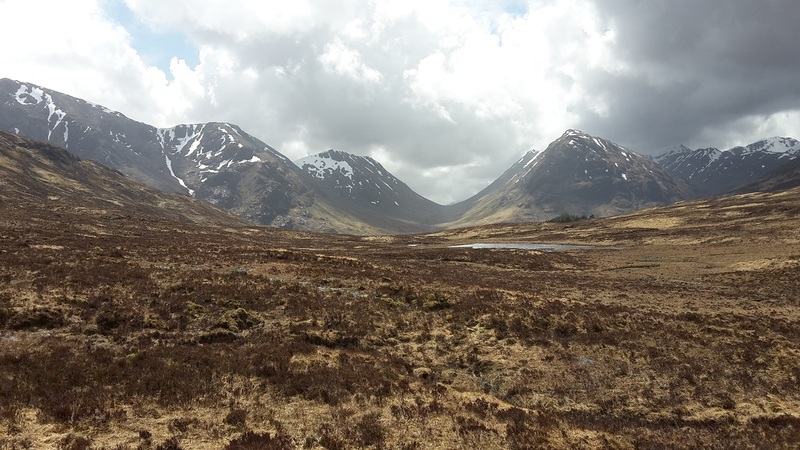 But also incredibly atmospheric , with views of the peaks in Glen Coe building as you meander across the wet and marshy plain between the two. As a foul weather alternative I thoroughly enjoyed the day, full of interest and history. 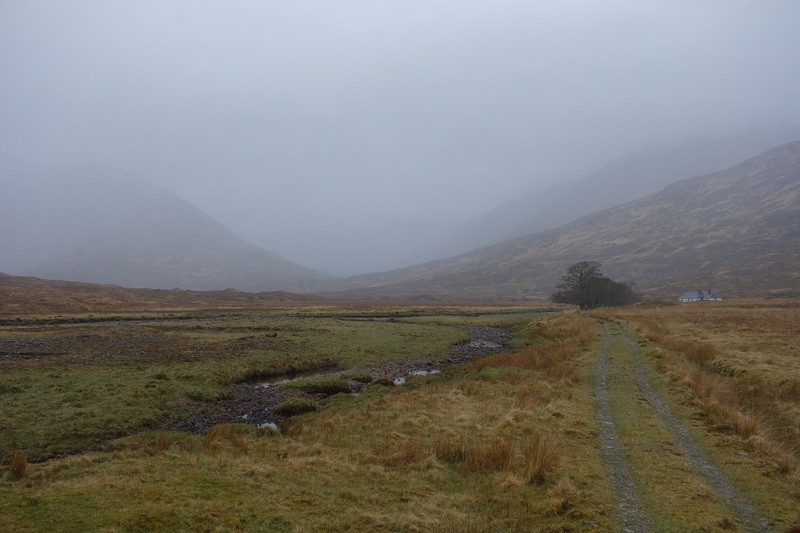 At Kinghouse that evening, after a welcome pint and drip dry, it was then a case of trying to find the lone dry spot in an increasingly waterlogged glen and hunker down for what would prove to be a wild and windy night. Sleep would be disturbed no less than three times as I ventured out of a thrashing tent to secure it through howling winds and driving sleet. The tent and I survived intact, but next days weather dawned no better. Some impressive ice features on day 1. Sorry to hear about the camera, I hope it has now recovered. How did the Notch survive the trip? It is still my favourite shelter. The camera died completely I’m afraid, a very costly error. As for the Notch it’s by far and away my favourite shelter, especially after a few slight modifications last year. I had Linelocs added midway along the bottom of each door panel and threaded each with some bungee, so in windy weather I can stop the side panels blowing inwards. I also changed the cord on the low ends to 3mm (the cord supplied can slip badly in high winds). I peg out the end corners with titanium skewers which gives a much better pitch. It’s now pretty bomb proof. On extended trips like the TGO I take a short DAC pole so I can peg out one of the doors as a canopy. Wonderful tent. I like your modification of the Notch, and wondered who added the line locs , SMG? Do you think that linelocs/loops on each of the side panels is a worthwhile investment. BTW I agree on the ti skewers at the ends and yes 3 mm cord is a better option. My main complaint these days is the lack of a “solid” roof on the inner, as that is where I have had moisture drip on me. BTW I usually carry a spare section of my pacer poles for using with the camera tripod and the what if situation so the canopy is always an option. The only problem I’ve ever had with the Notch has been a couple of the grossgrain lines which clip the groundsheet to the end apexes coming loose (stitching coming undone where they’re attached to the corners of the groundsheet). An easy repair job. I guess these lines can come under a bit of tension if you peg the tent out tight. Marc at Trekkertent added the linelocs for me as a favour. I’d bought one of his early Stealth tents and had done a review on that. In strong winds I was glad to have them, they don’t do anything the make the Notch more stormworthy, they simply hold the panels away from the inner in winds. For the canopy I carry a 1m length of 3mm cord threaded through a Lineloc which has a tape loop on it. I can put the tape loop over the top of the pole for the canopy, or when I close down the tent in high winds I quite often use the same cord clipped to the upwind end of the tent to act as an additional guyline. Wonderful first few days. Hard days yes, but what memories. The more you’re enjoying it, the easier it feels sometimes. Thanks Jane. There’s something for everybody in Scotland. 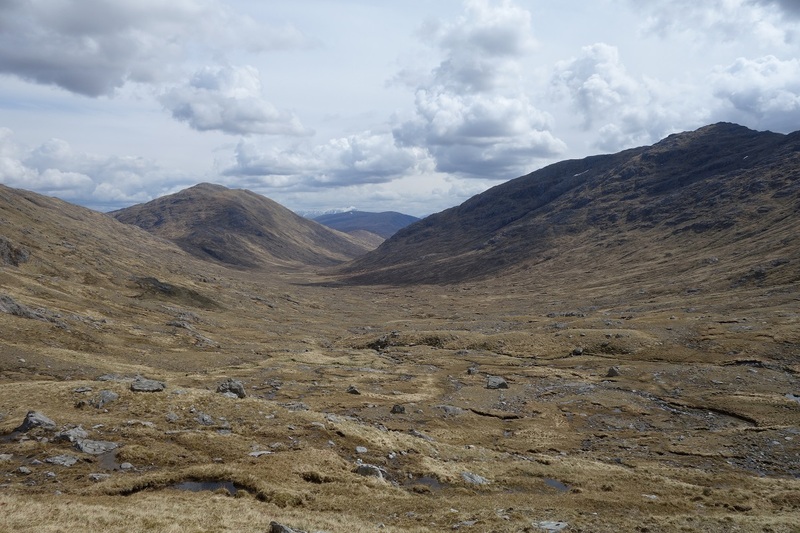 The wide open spaces give it an air of being challenging but it’s fairly easy to find routes through the Glens lower down which anybody could walk. I like a mix of going high for the views and endless skies, then coming back down to feel that bit more intimate with the valleys. Wow! Some stunning photogaphs, John, especially the one that heads the post. What a route, and what an experience for you. By the way, I still think that the Tarptent Notch looks weird – but if it works, so what!!! The Notch looks like something from the 70’s, reminds me of some of the old saunders and ultimate tents which had two upright poles at the entrance. It’s not for everybody as the inner isn’t massively spacious. But it has two vestibules, plenty of length and is 115cm high in the middle so loads of headroom. At 770g I think it’s excellent. Tents are like no other gear, I think they bring back more memories than rucksacks, sleeping bags etc. Over time you have firm favourites that become more like best friends. The TarpTent Notch has been mine for the past few years. Thanks Louise, always great to know someone’s reading my bumf. I think that crack of thunder could have been heard from Torridon down to Oban, it was like a sonic boom going off. A bit worrying when you’re stood under a lone pine tree in the middle of a flat expanse. I was obviously in the right place days three, four and five, plenty of rain but no thunder and lightening. Phew! Very good John, and vaguely similar to my 2010 route that was similarly enjoyable, if not quite so frantic. Thanks Martin. Yes it perhaps could have done with being a wee bit shorter, perhaps just to have a short day in hand. But I never felt pushed at all and only walked past 6pm on two days. The distance and ascent suited me perfectly. 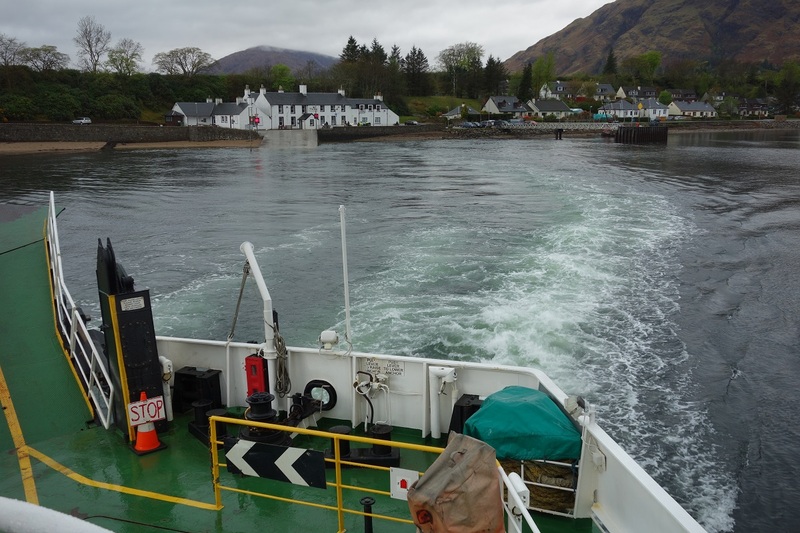 Especially the route over to Conan Ferry. Mighty stuff. Cheers Andrew. 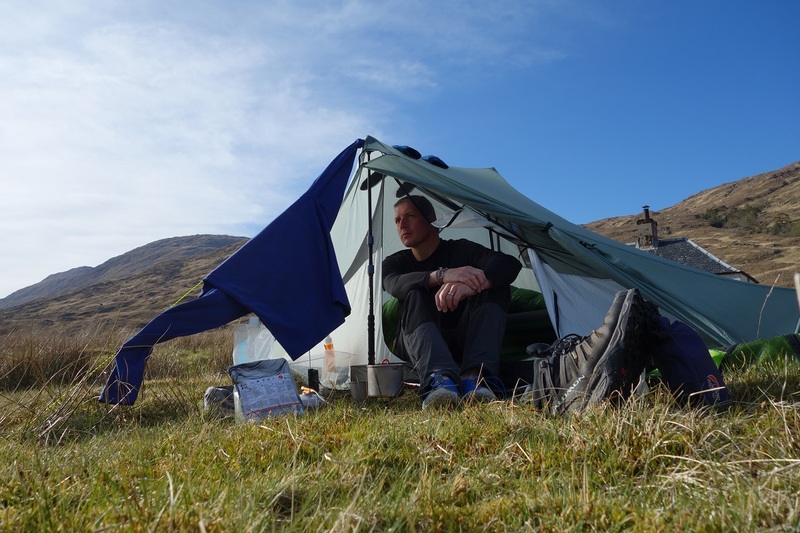 Just been watching that little video you posted on your blog, must have been the same night my tent was thrashing about in Glen Coe.